When I was a junior in high school, two of the most important people in my world left me. My grandparents, Ray and Marie, both passed away within 3 months of each other after long and grueling struggles with their respective ailments. We were incredibly close, and though the news wasn’t surprising losing them shattered my heart in ways I never could have defended against. Though crumbling for the 6 months or so leading up to their passing, my life fell apart completely once they were both gone. My academic performance tanked, my mood flat-lined at an all-time low, and I dreaded putting on my smiley façade when I had to leave the house. I managed to keep school attendance afloat, but my social appearances were peppered in only often enough as to not alert anyone of a sudden or drastic change in behavior. That was pretty much the name of the game: flying under the radar, faking it until I made it. My need to appear like I “had it all together,” that I was “an independent woman,” was at odds with my grief. Even in my own home, I didn’t feel right sharing my pain. Seeing me sad made things harder for my dad, who lost his own parents, and I’ve always had a hard time showing weakness in front of my mom—an unintended consequence of my ego and her being a strong woman, colliding. None of my friends had close relationships with their grandparents, and few were able to relate, and of course my rigid need to appear strong prevailed among them as well. I have never felt more alone than I did in the year surrounding my grandparents’ deaths. I spent a lot of time on my own, going for long drives, eating Ben & Jerry’s, and sleeping to escape what was going on in my head. Eventually, I distracted myself by progressively returning to my social life, and spent my alone time turning inward and reflecting on my favorite memories with them. Oddly enough, this was something I shared on social media— commemorative posts after their passing, posts each year on their birthdays, sometimes posts just because. The difference between my posts and my reality was that online, I appeared to be thriving in the face of devastation. Sad, perhaps, but also celebrating their lives, not lamenting them. It wasn’t until I started writing this that I realized the stark difference. 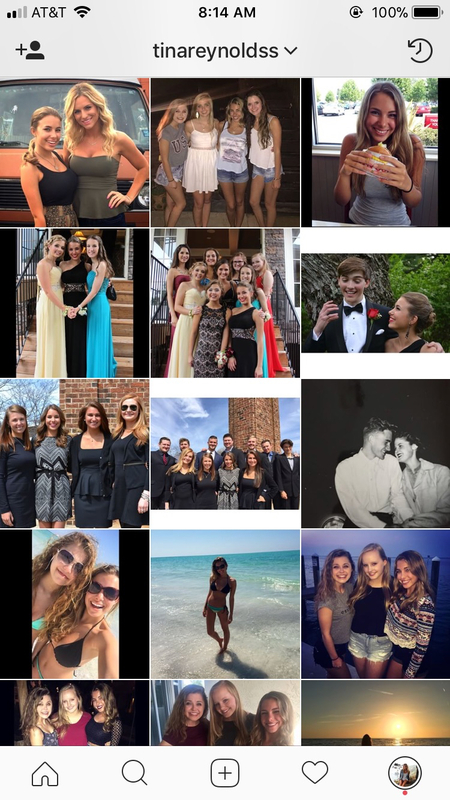 To the blind eye, my life at the time was nothing but happy photos with friends and family, smiling junior prom moments, and everything else that reinforced high school normalcy and a positive aesthetic. Scrolling back through my Instagram feed, it’s no wonder that nobody really knew what was going on with me. Surrounding my posts were more evidence against my internal crisis. To anyone experiencing loss, learn from my mistakes. Embrace your grief and serve yourself first, not your image. If you need to stay in and go radio silent, do it. If you need to talk for hours, find anyone who will listen. If you need to distract yourself, take up a new hobby. Honor your body and your mental health, and let the social media highlight reel follow your recovery.